For the first time in a generation: The essential writing of I.F. (Izzy) Stone—the brilliant investigative journalist whose work is as fresh and as urgent as the day it was written. Izzy Stone was a reporter, a radical, an idealist, a scholar and, it is clear, a writer whose insights have more than stood the test of time. More than fifteen years after his death, this collection of his work from I.F. Stone's Weekly and elsewhere is astonishing in its relevance to our age, addressing the clash between national security and individual liberty, the protection of minorities, economic fairness, social justice, and the American military abroad. The core of Stone's genius was his newsletter, I.F. Stone's Weekly, published from the mid-1950s to the early 1970s. His meticulous dissection of the news was unsurpassed, a direct descendent of the great pamphleteers like Thomas Paine, and a forerunner to the best of today's political blogs. Stone's brilliant, investigative reporting; his wonderful, impassioned style; and his commitment to his values all make this collection an inspiration, and a revelation. I.F. (Izzy) Stone (1907–1989) had a remarkable journalistic career, as an editorialist at the New York Post during the Great Depression, a longtime staffer at The Nation, the author of many books, and the founder and editor of his own I.F. Stone's Weekly, he "spoke truth to power" with an effectiveness that few have done before or since. “Mr. 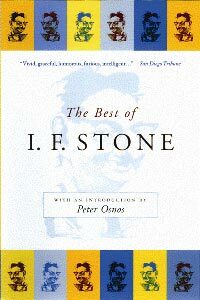 Stone's words, his themes, indeed his persona are captured well through the 65 essays collected in The Best of I.F. Stone."